Current foot, 2 years post surgery. I remember having spurs on both feet that grew to huge sizes. When I finally went to a podiatrist, I was informed of the situation and the choices I had. He told me they were the biggest he had ever seen and he recommended surgery since they caused me considerable pain after long periods of standing. 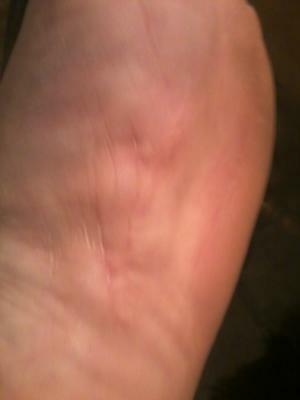 So in March of 2009 I decided to get the worst foot done first and see how it went. I was in Vicodin but it did practically nothing for the pain. I have an unusually high pain threshold, and let me tell you, this was the worst pain I have ever experienced in my life. That lasted for about two weeks until I returned to get my stitches out. I got that all done, put a removable wrap on it, and got an orthopedic shoe to walk with. Well, it was only a few days later that I realized that the doctor did not take all of the stitches out of the incision. The skin had grown over them and as far as I knew they were not biodegradable. To this day I can still feel them in there. The option he gave me was that we could cut it open and take them out or just leave them in. Needless to say, that was the last time I saw that doctor. Since then, massive scar tissue has built up around the wound to the point where it felt like the growth returned, and finally, this year, I realized that it indeed is beginning to come back BEHIND the scar tissue. What is worse is that from about a month after the surgery, I would get random EXTREMELY sharp pains in the location of the surgery. This was very rare at first and my local doctor assured me that it is like that for any surgery. Two years later and the pain happens on a daily basis , even when I am not walking or using the foot at all. It is far worse than anything I felt prior to surgery, and the growth that has come back, when you include the massive scar tissue, covers far more area of my foot. simply face the pain when doing anything athletic whatsoever? I plan to go to another podiatrist in the next few weeks and I am going to see what he recommends. I understand why, but if removing the spurs didn't magically help like they said it would...why do you think removing them again is going to be any better? Maybe it will, maybe it won't, I don't know, but what if it makes things worse again? 1. Learn How To Reduce Inflammation and start doing that a lot. 2. Magnesium for Tendonitis. Both for the Tendonitis as well as the bone spur formation. More on that in a bit. 3. Check out The ARPwave System. There is a complex dynamic at play causing everything your experiencing, of course, so take that in stride when I say the following. * When muscle/connective tissue is pulling too hard on bone, bone makes itself stronger to deal with it. "The body shapes itself to the forces placed upon it." * Surgery doesn't remove ANY the factors that caused the bone spurs etc in the first place. So OF COURSE your bone spurs are growing back. Unfortunately doctors don't tell you that. There's a lot more I could say, but let's stick with getting you out of pain. First things first. See/do #'s 1-3 above, then get back to me with questions and updates. Also, tell me more about your Plantar Fasciitis history. I assume it's more than just the bone spurs. ?